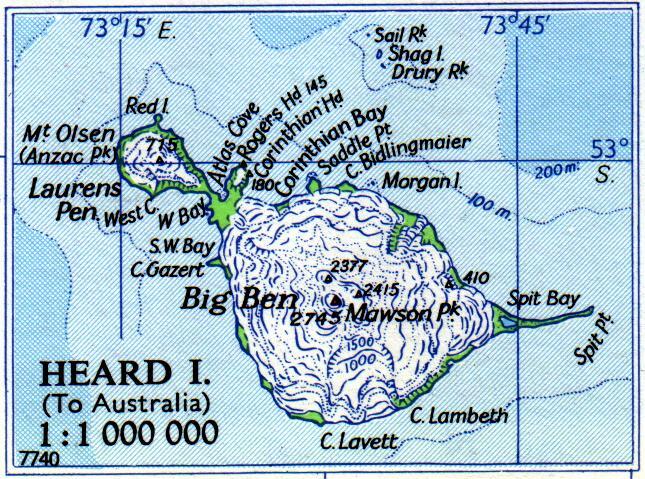 Part of the Australian Antarctic Territory, Heard Island and the nearby McDonald Islands are among the most remote islands in the world. We arrive at Heard Island 149 years to the day after its discovery in 1853, and anchor in Atlas Roads just outside Atlas Cove. 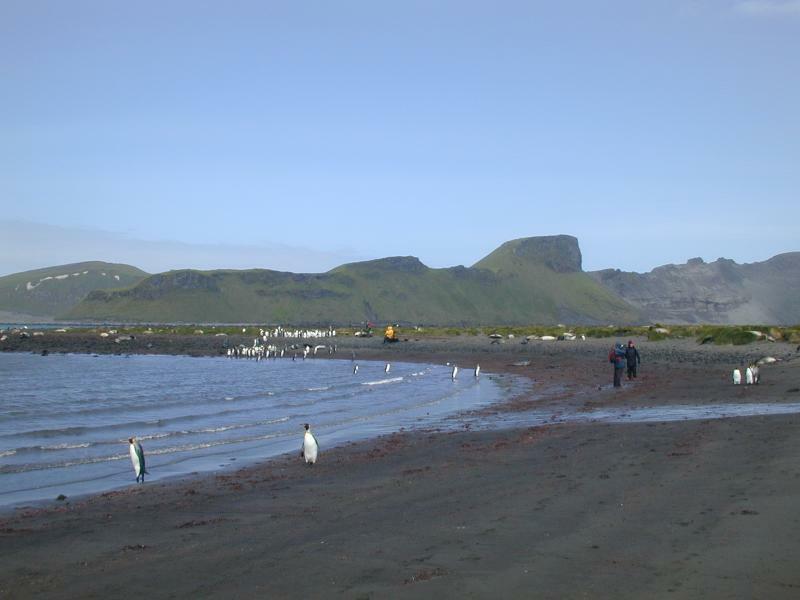 Landings begin at around 0845 on Walrus Beach (named for the Walrus aircraft that made just one flight in 1947 before being destroyed by 100 mile-per-hour winds; actual walruses are not found in the southern hemisphere). 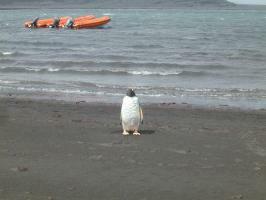 The temperature is 6 C (43 F) and there is a strong wind from the west. 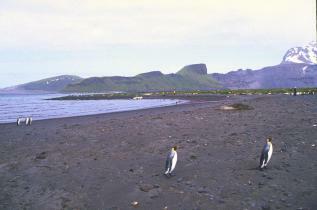 Fortunately, the cove is sufficiently sheltered that we are able to make landings with no difficulties. 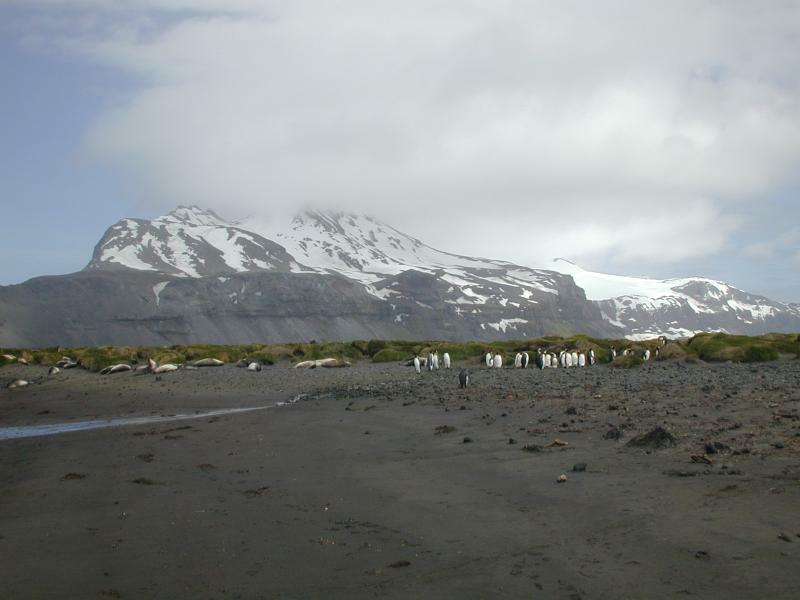 Heard Island, one of the last subantarctic islands to be discovered, lies at 53 degrees South latitute and is dominated by the massive, ice-covered volcanic dome called Big Ben. 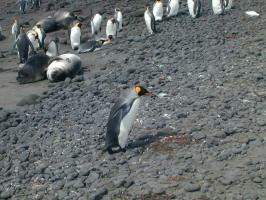 Walrus Beach, Atlas Cove, Heard Island: the sight of king penguins and an elephant seal tells us we are on a subantarctic island. 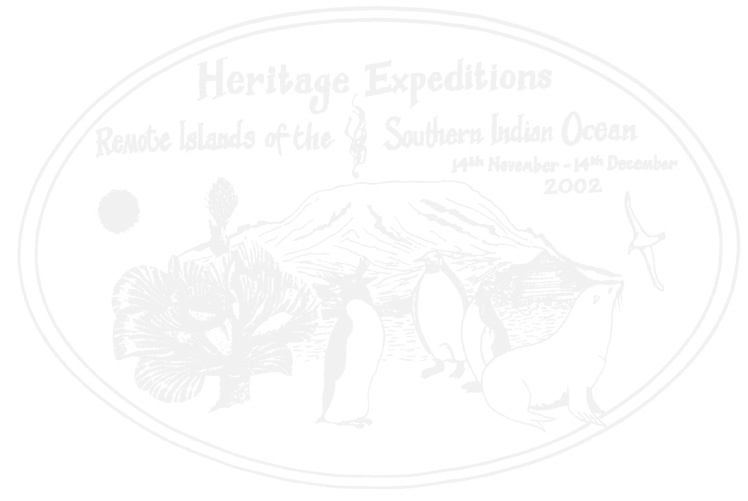 Cameras are busy recording details of our visit to one of the most remote (and least visited) islands in the world. Penguins and elephant seals line the edge of a line of tussocks of Azorella moss on the edge of the aptly named Azorella Peninsula. 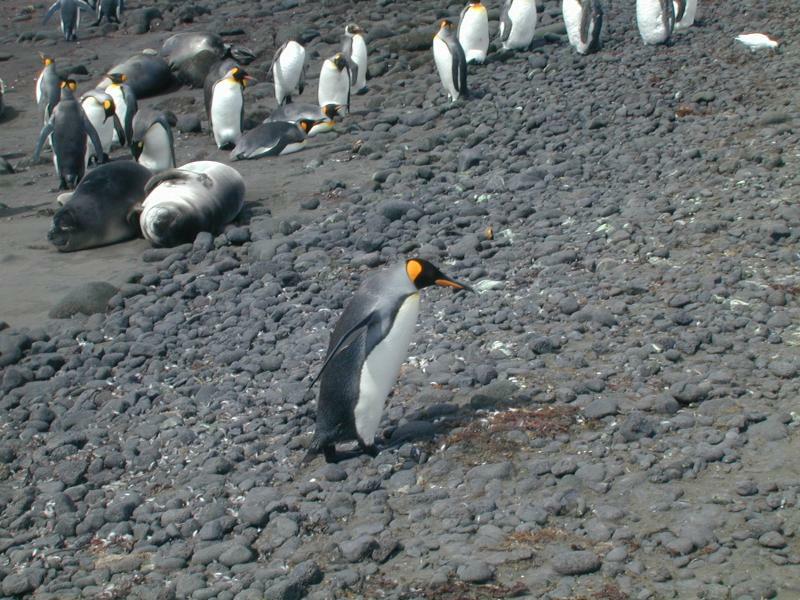 A king penguin moves ashore across the volcanic sand and rounded pebbles of the beach. 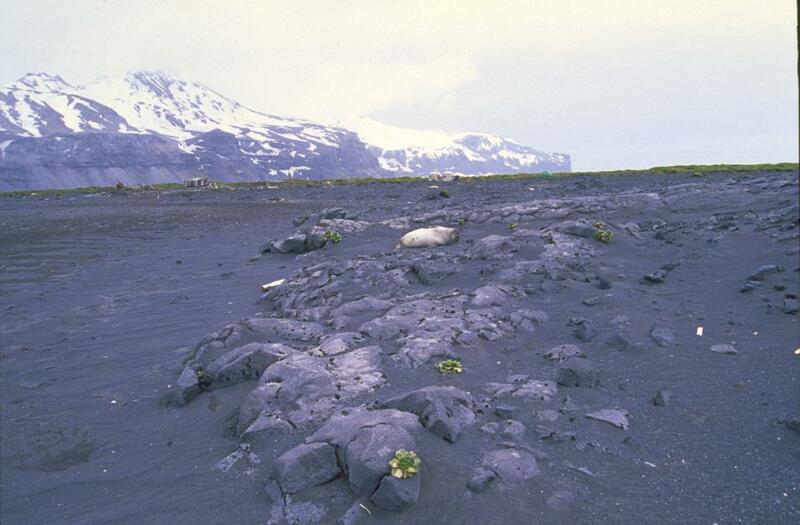 Elephant seal pups slumber just above the water line. A gentoo penguin poses in front of the ship's three Naiads anchored in the cove. 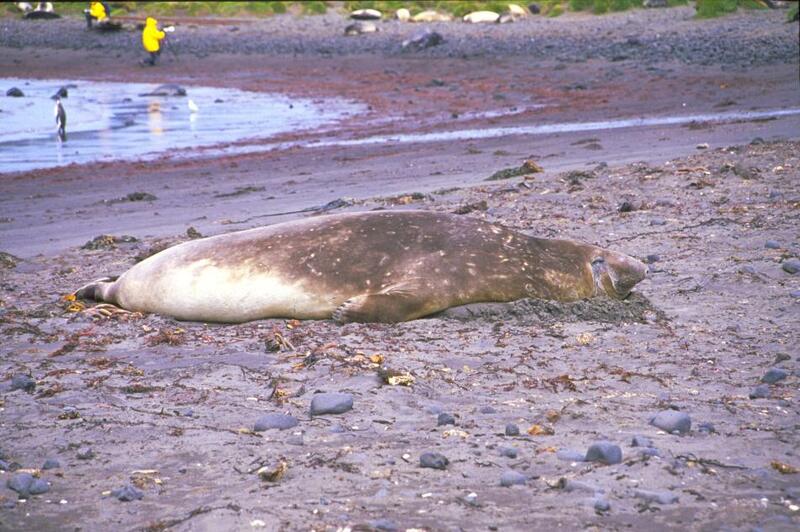 This elephant seal seems to have built a chin rest in the sand. 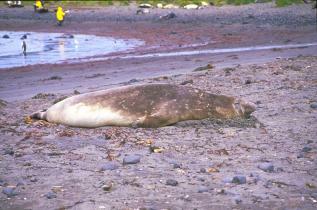 The reddish material on the beach behind the seal is kelp. 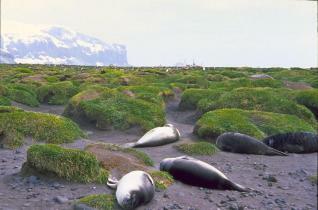 Seals dozing helter-skelter among the huge tussocks of Azorella moss. 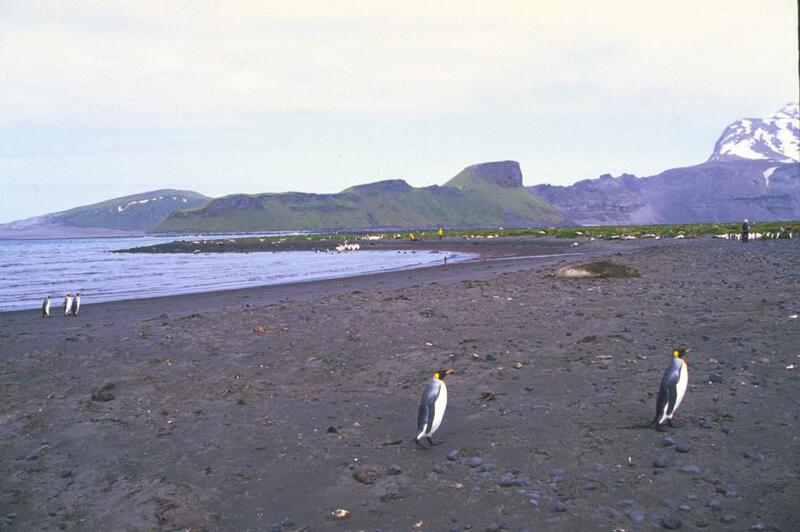 In the distance, the mast and superstructure of the Shokalskiy can be seen. Kerguelen cabbages grow in surprisingly barren locations, needing nothing more than a rock in which to send down roots. 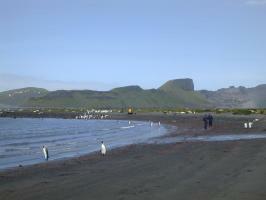 In the left background can be seen the huts of the Australian scientific station that operated from 1947 to 1955. 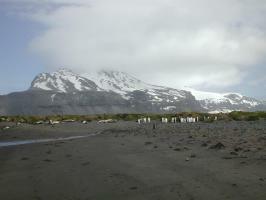 There is no longer any permanent human presence on the island.